Aegagropila linnaei, known in Japanese as “marimo,” is a species of green algae found predominately in Northern Lakes. These rare marimos have been found naturally growing as small lake colonies in Scotland, japan, Estonia and Iceland. In order to form, these marimo (they are often called “moss balls” as well, though the species has no relation to moss other than its green, velvety appearance) require very specific conditions: including low light, consistent and gentle wave flow—which is needed to form the spherical shape—and sedimentation on the lake floor. The balls appear to be coated in a layer of soft, green algae, although in reality they are packed with chloroplasts to the core, and are not just rocks or other materials covered in algae. 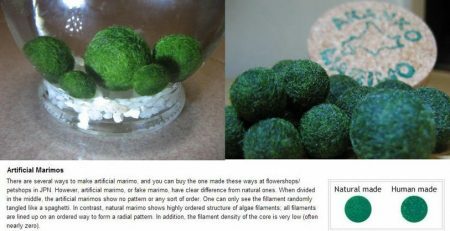 The marimo balls are always entirely covered by the green algae, since they are constantly being turned over by lake currents and must be able to photosynthesize from any angle. In Japan, where the human creation of these algae balls is most prominent, as you can guess from the fact that the name “marimo” is Japanese, they have been a protected species since 1920 and are considered a national treasure. 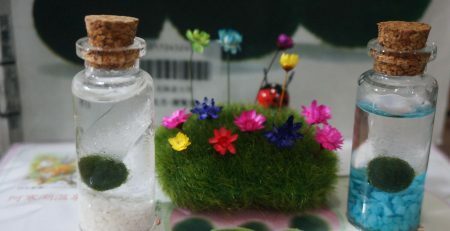 Considering how difficult and rare the marimo ball colonies are in the natural world (they occur naturally in only the four nations listed above, and even there they are rare and must be carefully protected or they will die out), domestic cultivation of these floral phenomena is surprisingly simple. Because of their spherical shape, and therefore low surface-area-to-volume ratio, marimo balls don’t require much sunlight to develop. They form on lake bottoms in nature, where there is little sunlight, and domestically they can thrive off household lighting with little to no indirect sun exposure. 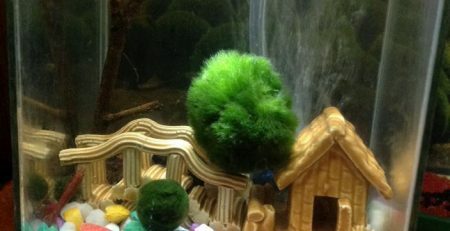 Marimo balls can be tiny, and are easy to keep even in small fish tanks or aquariums. In fact, since they absorb ammonia and other waste products in the water, they function as natural cleaners in an aquarium. In fact, marimo ball colonies can be formed in fresh or brackish water, and adding a small amount of salt is advised if your algae balls start to turn grey or brown. The plants do require low to medium temperatures, and should be kept out of direct sunlight or hot rooms, especially during the summer months. 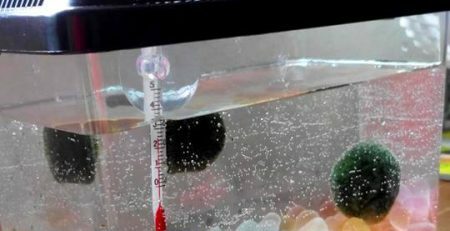 For marimo colonies that appear to be unhealthy, many recommend putting the balls in a bowl of water in a refrigerator. Marimo balls are easy to clean, but must be cleaned regularly. It is bad for the algae if too much sediment builds up on the outside of the ball. 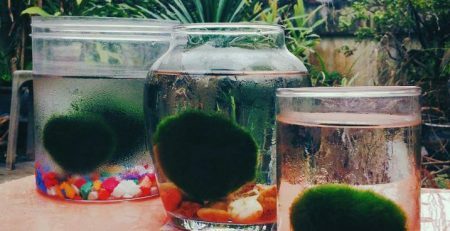 Marimo balls are also accustomed to lake currents constantly bringing freshwater, so whether or not you keep them in a bowl or in an aquarium, it is suggested that you change the water once every couple weeks, or once a week if the weather is hot. 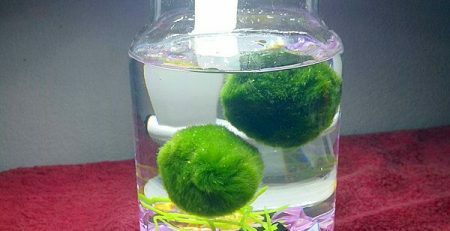 To clean a marimo, one can just pick them up and brush off accumulated dirt and debris, and then put them in a ball of freshwater and squeeze gently, this will push out the old water and put new moisture into the algae. Marimo balls are small, and grow at a slow pace of about 5 mm’s per year. 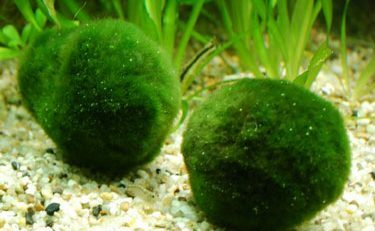 But in time a marimo ball can grow to be quite substantial or form multiple smaller marimo balls (the beginning of a self-formed colony!). There are some things to look out for if you are trying to develop a healthy colony. Marimo balls turning white means they are probably receiving too much sunlight, and they should be promptly cleansed and moved to a different location. 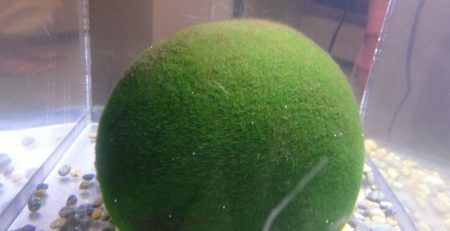 If the marimo turns brown it should be cleaned gently and the brown parts removed from the ball. This will temporarily alter the shape, but if you add a little salt to the water and make sure to roll the balls around more often so they get equal exposure, they should reform as nice spheres. If a marimo turns black, it probably means it is decaying from within, the most difficult (but still fairly easy!) condition to deal with. The black parts should be removed even if it means destroying much of the marimo’s mass. 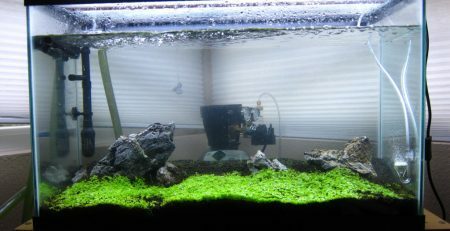 Reform the marimo from its small, green core and it should thrive again. If it turns black, that may mean the ball is too big for fresh water to reach the center, which is necessary for good health. At this point you can divide and reform the ball into multiple, smaller marimos, and continue to develop a colony. Marimo balls are widely available in a variety of forms. They can be purchased as objects in small bowl of water or in jars, or as a colony for a fish tank. 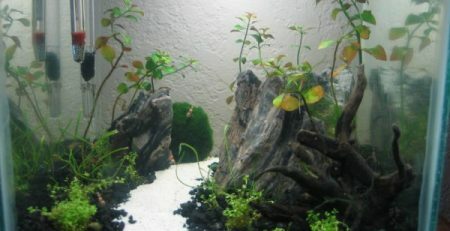 They are inexpensive, and can be found at most pet stores or as more unique organic fixtures from specialty retailers.